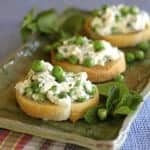 Flavor-packed bites of ricotta, peas, lemon and mint are easy, peasey solutions for dinner, lunch, breakfast and happy hour. How happy is that? Try small plates for healthier eating! Small plates are the darlings of restaurant menus. Recently I couldn’t decide between the signature dish of the restaurant sandwich or the spicy meatball sandwich. A one-slider serving option made the decision easy. I ordered both. But this trend isn’t limited to restaurants. The challenge this month from The Recipe Redux is all about small plates. Healthified, of course. From eating outside for al fresco dining or a simple picnic to serving small bites at a bridal or baby shower or a graduation party, my fellow food bloggers are creating morsels to savor. Small plates satisfy my taste curiosity before flavor saturation and palate fatigue sets in. Some believe that after a few bites, you’re taste buds get bored so then you don’t enjoy the flavor as much. 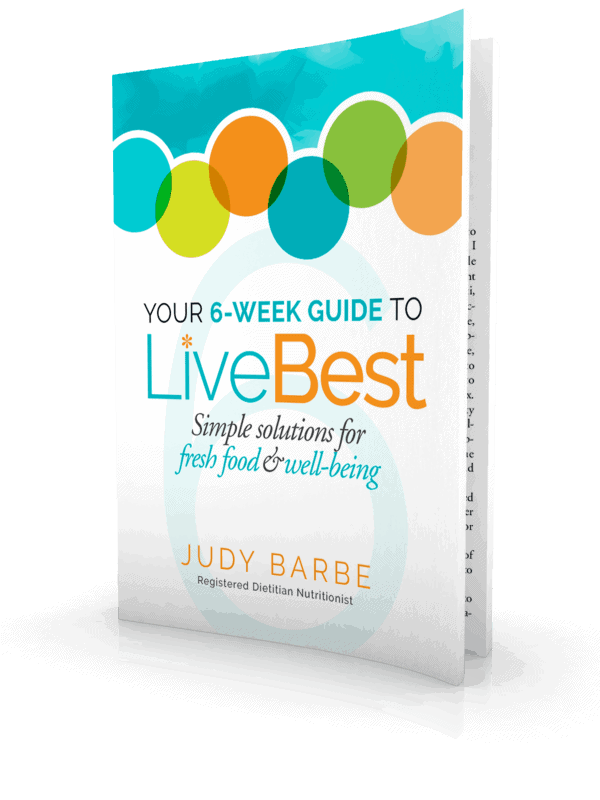 Research shows that eating smaller portions of foods satisfies a person just as well as a larger portion. The theory is that once you’ve swallowed something there is not much memory of how much you ate—you just remember, mmm…that tasted good. I also like smaller plates because it controls portion size. Most of us eat more when given larger plates than if we were served smaller plates. In addition to helping us trim our waistlines, these small plates reduce food waste. Speaking of food waste…ricotta is one of those foods that seems to hang out in the fridge. You buy it to make lasagna, but then what? Mix with veggies to fill an omelet. Bake in Walnut Lasagna Rolls. 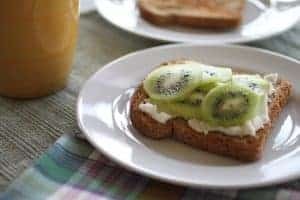 Spread on toast and top with sliced fruit. Spread on a pizza or stir into pancake batter. Top ricotta with ripe strawberries and a drizzle of honey or juicy blackberries and a sprinkle of brown sugar. Whisk a few spoonfuls of ricotta into a simple vinaigrette for a creamy dressing. 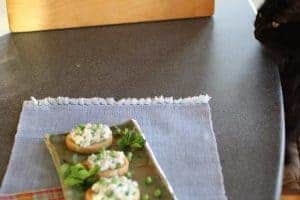 I like this bruschetta recipe because it’s easy, fresh and taste great plus ricotta is protein-rich so delivers a benefit. Make it in spring and summer when fresh mint is abundant. Breakfast, lunch, dinner or appetizer, this recipe works on any menu. 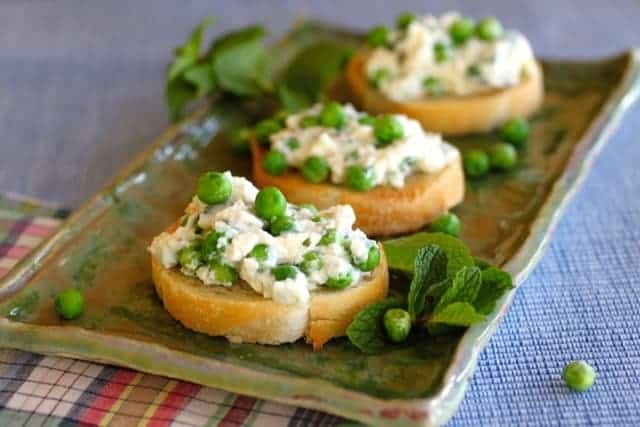 Flavor-packed bites of ricotta, peas, lemon and mint are easy, peasey solutions for dinner, lunch, breakfast and happy hour. How happy is that? 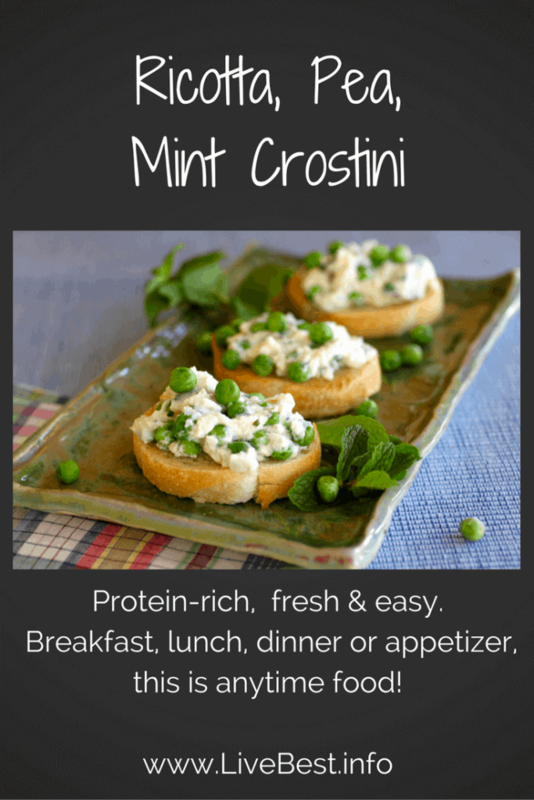 Try this ricotta, pea, mint crostini recipe! If using frozen peas, cook according to package directions. If using fresh-shelled peas, bring a pan of water to a boil. Add peas and boil about 45 -60 seconds. Remove the peas from water and drain. Let cool to room temperature. In a small bowl, stir together ricotta cheese, Parmesan, lemon juice and zest, peas, mint, and salt, mashing some peas as you stir. Spread ricotta mixture over crostini. Sprinkle pepper over the top and drizzle with 1 tablespoon olive oil. To toast baguette slices. Using the 2 tablespoons olive oil, brush one side of bread lightly with olive oil. Place on baking sheet and bake in 350° oven for 8-10 minutes until lightly browned. Jett is curious when I’m photographing, but he’s even more interested when I cook with dairy! Have I converted you? As long as I’m not the one washing the dishes, I like this small plate movement! 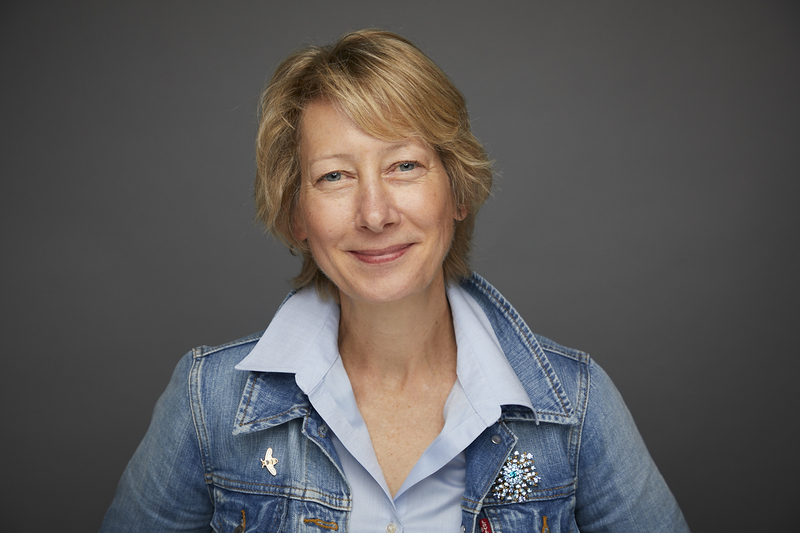 See how my fellow Recipe Redux are filling their small plates. YUM!! Love mint and peas together….add ricotta? Brilliant! Totally serving these at my next shindig! Thanks, Nancy. These are perfect shindig bites!